President Obama&apos;s budget plan reminds one Wisconsin congressman of a spaghetti western. Representative Paul Ryan says President Obama delivered an inspiring speech to Congress Tuesday night, but the budget he delivered today doesn&apos;t measure up to those inspiring words. "It&apos;s a spend, tax and borrow our way into prosperity budget," says the Janesville Republican. "It proposes bigger government, with higher spending, higher taxes and higher debt, as a means to produce prosperity in America." Ryan likens the president&apos;s budget to the Clint Eastwood western The Good, the Bad and the Ugly . Ryan says Obama should be commended for correcting past budget flaws, but the rest of the budget is bad – massive increases in domestic spending, and ugly – a massive tax increase. "You don&apos;t raise taxes in a recession," says Ryan. "This budget is raising taxes in a recession. This budget is going to have a $1.4 trillion tax increase." Ryan says the tax increase will hit small business people hardest. 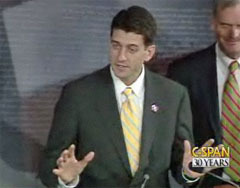 "That&apos;s what so galling about this budget," says Ryan. "The notion that you raise taxes on the people that are most likely to create jobs in a recession. It just boggles our minds that they would actually try to pursue this kind of an economic agenda at this time." Ryan, ranking Republican on the House budget committee, also says the administration quadruples domestic spending over four years, then uses gimmicks to claim they&apos;re cutting the budget deficit in half. Ryan and New Hampshire Senator Judd Gregg, ranking Republican on the Senate budget committee, delivered the GOP reaction to the president&apos;s budget during a press conference in Washington.